Some vehicles assembled in North America use engines or transmissions from outside the region. (Source of engine in gray, transmission in red). Foreign car makers are considering moving more of their manufacturing to North America following the recent U.S. trade deal with Canada and Mexico, writes The Wall Street Journal (Oct. 8, 2018). 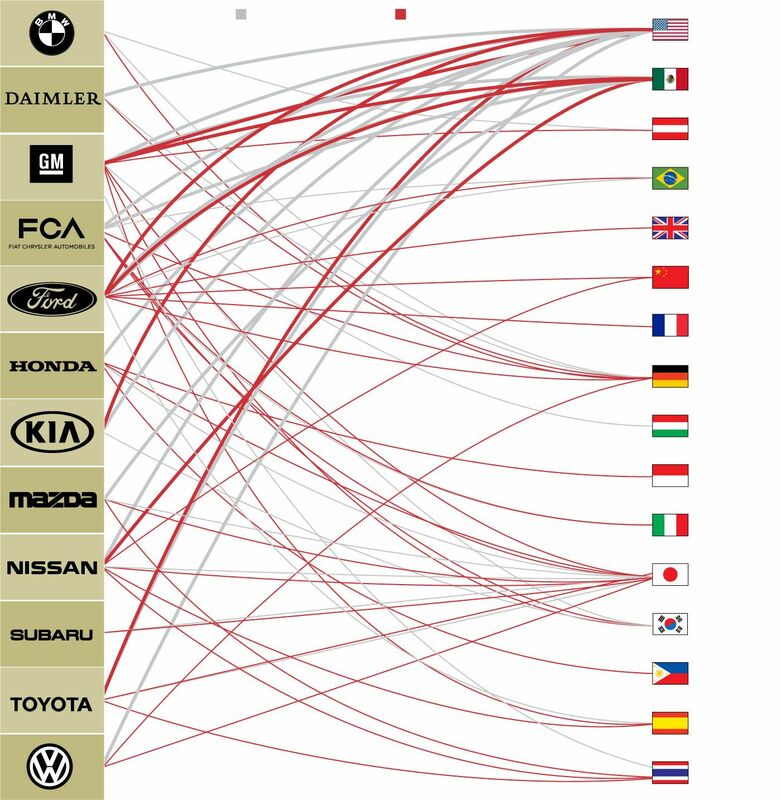 As the U.S. and Canada reach a pact to replace the roughly 25-year-old North American Free Trade Agreement, foreign car makers suggest changes to their supply chains that would result in more auto-parts manufacturing in the U.S., Canada and Mexico. Daimler said the new agreement could force the company to move more engine manufacturing to the U.S., where it builds vehicles at a factory in Tuscaloosa, Ala. The Renault-Nissan-Mitsubishi alliance said the new pact would spur the car-making group to invest more in both the U.S. and Mexico. The new rules will be phased in over the next 2-5 years, about the time it takes to develop a partially or fully revised car model. Car makers are likely to look at moving engine and transmission production first, because those parts make up roughly 30% of a car’s value. 1. What is the significance of the graphic on the left? (Click to blow it up). 2. What will be the impact on domestic car manufacturers?